Most people who have hypertension don’t know it. Hypertension, or high blood pressure, is when the pressure of the blood in your arteries rises to an unhealthy level. Left untreated, hypertension can lead to heart attacks or heart failure, strokes, aneurysms, and damage to your eyes and kidneys. Age. The older you are, the more your risk of high blood pressure grows. Race. High blood pressure is widespread among blacks, and health complications from it tend to be more serious. Family history. If you have close relatives with hypertension, you are more likely to get it. Unhealthy weight. The more you weigh, the more the pressure you put on your artery walls and the higher your blood pressure. Being a couch potato. People who are inactive tend to have a higher heart rate, making your heart work harder and putting more pressure on your arteries. Too much salt (sodium). Before you reach for the salt shaker, too much sodium in your diet causes fluid retention, leading to higher blood pressure. Too much booze. Having more than three drinks in one sitting can raise your blood pressure to unhealthy levels, and long-term heavy drinking can cause heart damage. Stress. High levels of stress raise your blood pressure. And if you cope with stress by eating more, using tobacco or drinking alcohol, you only make the problem worse.. Even though hypertension usually has no symptoms, it can be easily detected. Have your blood pressure checked at your next doctor’s appointment. People who make lifestyle changes and get their blood pressure under control can often reduce their need for medicine, and sometimes even stop taking it. If you haven’t had your blood pressure checked in the last year, now’s the time to contact your doctor. Don’t let the silent killer sneak up on you. 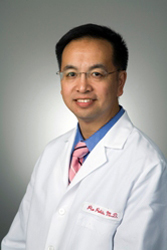 Dr. Pio Poblete is an MPCP partner and sees patients in the Columbia office. He received his medical degree from University of Virginia School of Medicine and is certified by the American Board of Internal Medicine.